You just never know what you will find on my blog. Well, you know that cars are my thing. I also like to help people make good "car decisions". So, in that spirit, allow me to recommend a fantastic tire to you. Everyone needs tires at some point. 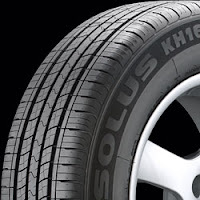 BUY KUMHO!! Kumho tires rock! I am on my second set (only because I put so many miles on the first set). I am specifically fond of the KH14 and KH16 model. They are cheap as dirt, good quality, great ride, good traction, very quiet, and you will be hard pressed to find a negative review anywhere. They are starting to put them on new vehicles and my mechanic friends rave about them as well. I am a Kumho spokesperson today! Great tires.